The arrival of the Sony Ericsson Xperia Play didn't exactly show the world that there is a need for analogue game controls over touchscreens, but that hasn't stopped Fructel from releasing the intriguing Gametel joy pad add-on for Android devices. Measuring about half the size of a normal smartphone, the Gametel seamlessly links up with your device by Bluetooth and can be clipped on to the side to give your phone that Play look or used wirelessly. It's a simple but great idea and one which should work better when more games – especially from the PlayStation Suite – come out which make use of a control pad. 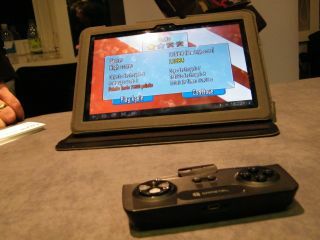 In our test the game pad worked really well. It's thick enough to balance out the phone it is strapped to so the device doesn't feel top heavy. As for the layout, it is very much like the Xperia Play – the buttons are laid out in a PlayStation style and the d-pad is also of a similar ilk. At the moment Fructel is claiming that there are 50 games compatible with the device and the full list is on their website. In our trial we had a go on Cordy and, although it wasn't a game-changer, anything has got to be an improvement on awful virtual d-pads you get with touchscreen games. To use the Gametel you need to have Android 2.1 and above and the accessory will set you back £49.99.